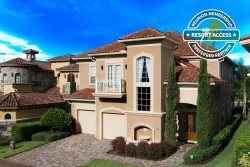 Located in the upscale Reunion Resort community of The Villas North with a great view of the 15th hole of the Independence golf course designed by Tom Watson. All of this is located in the exclusive Reunion Resort - just 6 miles from the gates of Disney World Florida and easy driving distance to other theme parks. A truly beautiful place with world class amenities such as infinity pools, a full-service spa, scenic walking trails, fitness center, on-site fine dining, kids activities and much more. This truly is a luxurious three-bedroom corner unit condominium full of natural light. The spacious living room and dining area have been furnished to an extremely high standard. There is comfy sofa, flat-screen TV complete with DVD player. There is also a fully functional kitchen which is very well equipped with stainless steel appliances and granite counter tops. The separate dining area has a beautiful dining table with seating for 6. Guests staying in this condo will enjoy luxury and comfort. Large sliding patio doors lead out to your own south west facing balcony with a table and seating for 4 where you can enjoy great views of the sunrise and sunset. The Master en-suite bedroom has a luxury King bed, a wall mounted flat-screen TV and cable. There is a large walk-in closet with an electronic safe, and a large en-suite bathroom with dual sinks, bathtub, and a large walk-in separate shower. The second bedroom has a Queen bed, a wall mounted 32" flat-screen TV with cable. There is a large closet and an en-suite bathroom. The third bedroom has 2 luxury Full beds and a flat-screen TV. There is a large closet and an en-suite bathroom. Our stay was wonderful, apartment was clean, tidy and had lots of room, its exactly like the pictures, would be renting again. Everything was perfect. Everything was perfect, amazing and clean. These condos at Reunion Resort fit our needs perfectly. We could not ask for a better situation, and the staff is great to work with as well. Loved that the bedding and furnishings were updated!